The elite men’s field was stacked with prestige and world class experience. However, none could match the pace of 2018 Enduro World Series Champion Sam Hill who was in a class of his own and attacked the six gruelling stages in striking form, to earn the win. “Storms rolled in last night and gave us a pretty cold, chilly start to the morning. The trails are running awesome after the rain. Six good clean stages and had an awesome time out there today. “Stage one was one of my favourite tracks so we pedalled up there this morning, it was pretty cold and quite flat and rocky. A lot of mud was on the rocks so it made the trail pretty slippery and challenging. We then headed up the back of the mountain to three stages over there that are all pretty physical and definitely felt the off season in the legs on those. We got to do a couple shuttles for the last two stages. Abom yesterday was quite loose and slippery and today, it couldn’t get any better dirt really after the rain so that was by far my favourite stage of racing. “I normally kick start my training program on December 1st so I’ve started this weekend at the race. I’ll put my head down for the next three of four months and set goals for next year,” said Hill. Christopher Panozzo, who also joined the World Champion on the podium at the last series race in Derby, Tasmania, in November, claimed second place today. Ben Cory rounded the elite men’s podium in third position. Tasmania’s enduro specialist Rowena Fry continued her dominant streak in Mt Buller, with a powerful performance to claim victory in the elite women’s Enduro race today. “I had a really good first few stages and I was feeling pretty good but you never know how quick you’re going until the end. The trails here are really good, good diversity of trail. I think it was a really good mix for the event. “I have had a really good last end to the year and I am really enjoying pushing the skills on the enduro bike and I will see what next year brings. Loving it,” Fry said. Emily Parkes produced another showcase performance, across the challenging multi-stage course, to come away with second place. New Zealand’s top women’s enduro rider Rae Morrison took out third position and was thrilled to make it on the podium, after coming back from injury. Mt Buller was the final stop on the Shimano Enduro Tour and world class athletes Hill and Fry were awarded with the overall series trophies. 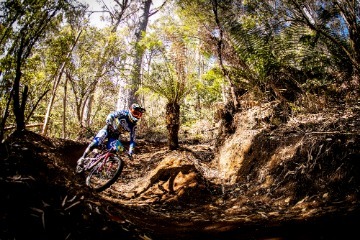 The race in Mt Buller forms part of the Asia-Pacific Continental Series, which allows riders to gain world ranking points into the 2019 Enduro World Series. The Continental series, which runs across four races in Australia and New Zealand, culminates with the crowning of the Asia-Pacific Enduro Champions in Christchurch, New Zealand, on 16 February 2019. In the Asia-Pacific series the top three riders in each category, per event, automatically progress onto the Enduro World Series reserve listing. With the Enduro World Series coming back to Tasmania in 2019, the top positions at the Asia-Pacific Continental Series were fiercely contested for today and the strong level of competition will continue across the series. With over 200 competitors across the fields today, the township of Mt Buller, Victoria, was transformed into a mountain biking hub. Fans and enthusiasts of the sport were in the mix of the racing action, with plenty of spectators supporting the action across various vantage points throughout the trails and village square. Shimano Australia were thrilled to headline the Enduro Tour and enjoyed being part of the action in Mt Buller, Victoria, to cap the circuit. “Shimano Australia is excited to see the progression of Enduro in the local market driven by success of the Enduro World Series,” said Toby Shingleton, Shimano Australia Cycling brand manager. To review overall results visit the website.